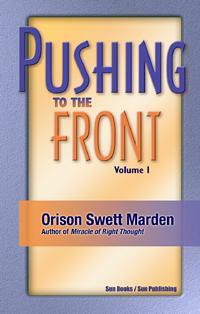 PUSHING TO THE FRONT VOL I by Orison Swett Marden. Opportunities Where You Are, Possibilities in Spare Time, How Poor Boys and Girls Go to College, Your Opportunity Confronts You-What, Will You Do With It?, Choosing a Vocation, Concentrated Energy, The Triumph of Enthusiasm, Promptness, Appearance, Personality, Common Sense, Accuracy, Persistence, Success Under Difficulties, Observation and Self-Improvement, The Triumph of the Common Virtues, Etc. 432 pgs. 5x8. Paperback. ISBN: 0-89540-331-5. $40.00.